Proof that more power isn't always the ideal. 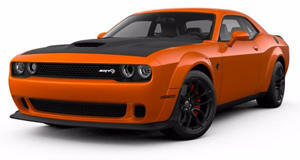 The main main reason why the Dodge Challenger Hellcat had such issue with putting its 707 horsepower to the ground was the fact that it only had two wheels to express its tantrum through. Countless examples of the Tesla Model S and even the Model X beating the Hellcat with relative ease can be found with a quick Google search, and part of reason why the electric cars were beating out what should have been the king of the drag strip was instant electric torque. However, it’s the all-wheel drive system that played the biggest role since four contact patches offer a substantial amount more grip. Tesla’s wins have really seemed to get at Dodge and the automaker is currently funneling money into developing the Challenger Demon to right its wrongs, but in the meantime, we have the AWD Challenger to play with. In this experiment, we get to see just how much of a difference all-wheel drive plays in a drag race. The winner of the race should be a no-brainer, not just because thew Hellcat has the most powerful engine in FCA’s lineup but because the all-wheel drive Challenger also gets the least powerful motor. Not even a midrange V8 is offered to help the AWD Challenger stick it to its more powerful brethren, but at least the Hellcat forgoes its red key to tone the horsepower down to 500 bhp. Summer tires on the Hellcat in 20 degree weather should help make things more interesting as well.